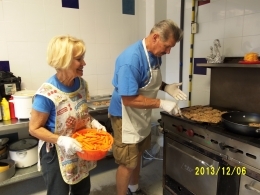 November 2013 - We Love Our Volunteers! The children at Sonshine are already getting excited about Christmas. Last week, they each made a list of what they would like to receive for Christmas. They had such a great time making their list...sharing with one another what they had written down. For some of these children, this could be their first Christmas where they receive gifts. But also, for many of our children this will be their first year separated from their mother and father. So Christmas can be a wonderful, magical time for them, but it can also be very difficult emotionally for many of the children. Our prayer is that each child will feel the love of Christ as well as the love and support of the staff members here at Sonshine Hacienda on Christmas day. If you would like to participate in making our children's Christmas a bit brighter this year, you could consider sending a donation designated specifically for that purpose. Just indicate in the memo portion of your check that it is to be used for Christmas gifts. This year, we are buying Christmas for double the amount of children that we bought for last year. God has blessed us so abundantly. Thank you for all you do to help us provide for these precious children. God bless you!! 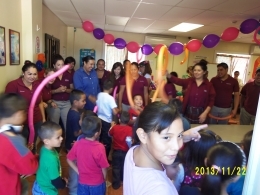 In late October, one of the High School's here in San Felipe asked if they could do a special presentation at Sonshine Hacienda for the children. The students participating in this project are from" CETYTEBC", a technical high school (versus an academic high school). This project was a "social" project that they are required to complete in order to graduate. We agreed to have them come and it was a great experience for the children. The students all came with painted "clown like" faces and tons of balloons. They decorated our great room before the children returned from school. They also provided a wonderful lunch for everyone, gave us food for our kitchen pantry and used clothing for our yard sale in 2014.They also did "face painting" on the kids...they love it!! But the best part, at lease for the kids was the presents that each child received. Each student had selected a child and had purchased two gifts for that child. The children's eyes were as big as saucers!! But the thing that impressed me the most about these high school students was the kind, gentle manner they displayed with the children. These are fine young men and women. I was very impressed. I made sure that I expressed that to their teachers. I let them all know that they are welcome to come back and visit anytime. These students are great role models for our children. 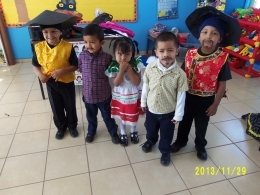 Our cute Kinder Kids are all decked out in costumes that Diana, our Administrator made for them to celebrate Columbus Day. They are so cute!! VOLUNTEERS...WHAT WOULD WE DO WITHOUT YOU? Volunteers are our unsung heroes!! I had no idea that there was such giving, generous people in this world until God blessed us with the opportunity to work them at Sonshine Hacienda. They selfishly give of their time and skills to help us accomplish the tasks and projects that need to be done here at Sonshine. ACTUALLY, THIS NEWSLETTER IS BEING DEDICATED TO ALL THE VOLUNTEERS THAT HAVE BEEN WORKING SO HARD ON OUR MANY PROJECTS. Two of our unsung heroes are Phil and Donna Varnak, from Auroras, Co.. 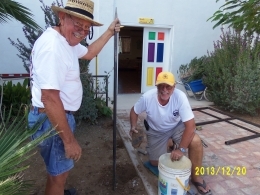 They have been faithful friends of Sonshine Hacienda from the onset of the building project. They have poured cement, carried concrete block, done electrical work...you name it, they have done it. This past month they returned for three weeks to their home in San Felipe for some vacation time. But instead of taking long walks on the beach or spending time at the golf course, these two spent a great deal of their three weeks at Sonshine Hacienda. They helped with needed maintenance issues and Donna tackled the sorting of donated clothing...a big job. The last day they were with us, they filled in for our cook who was on his day off and prepared the noon meal (our big meal of the day) for 30 of us. JOB WELL DONE!! 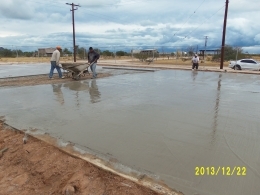 Just this past week we completed another phase of our Sports Field by finishing the pouring of our basketball court. It is a full court size and is just awesome. For this project, we hired our friend and Contractor,"Goyo" to do the job. We saved over a $1,000 on this project by using men from Nueva Cancion, a Christian Rehab Center for the manual labor. We pay the Rehab a reduced rate for the men's work and the money goes to the Rehab...to help them keep the doors open. Another blessing occured at the same time regarding the basketball court. Two of our friends & supporters of Sonshine from Sacramento, Purchased two awesome basketball goals for our kids. The money for the basketball court was provided by two donors as well. This court is going to be wonderful for the children. We can use this court for volley ball, tennis, skate boarding, bike riding, etc.. God is blessing Sonshine Hacienda!! AMEN. Jim Onsager and Harry Fries are volunteering their time to build a beautiful fence in our patio area. There are others as well that are helping Jim with this project. Thanks so much for your hard work! !